The stars are always in the sky, but we need darkness to see them. The moon is there too — 238,900 miles away, so much bigger than any other bright spot in the big sky. And it changes shape depending upon one’s view. The sun is always in the sky — whether it’s cloudy or raining, the sun is still there, as hot and bright as ever. We need our turn on that certain side of the Earth and the absence of clouds to see it. Consider the Aurora Borealis — the magical spectacle of green and blue lights in the Northern sky, dancing like liquid flame. Theoretically, those dancing molecules that light up the sky are always there, but conditions have to be just right to see it. This phenomenon happens when electrons are energized as they accelerate and follow Earth’s magnetic field into the Polar regions. There, they collide with oxygen and nitrogen atoms and molecules, causing energy transfers and excited atoms. When they relax back down to lower energy states, they release their energy in the form of light. Holding this idea in mind, consider love. When we “fall in love” with another, we identify that individual with that feeling of warmth and electricity; it’s as if they bestow love. But is your beloved really the source of that feeling? Falling in love, rather, is like holding a mirror up to our own fire, spirit, love, spark. We hold the potential for that kind of love within ourselves, but it seems to need the right conditions — the right person — for it to flare, shine, and dance. The feeling that we have inside our own minds and bodies when we are “in love” is ours. We own it. And when it’s switched on, it’s intoxicating; like almost nothing else — like the Northern Lights. Magic lights dancing in the sky; flaring, shining; collapsing and rising again. 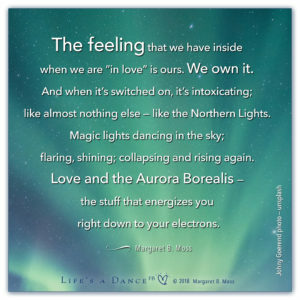 Love and the Aurora Borealis — the stuff that energizes you right down to your electrons. Deep love is sharply painful when someone we love is gone. It feels as if the sun has left the sky, that all joy inside — your own laughter, enthusiasm, imagination, and zest for life — has been sucked out into the ocean as surely as the tide before a tsunami. It’s easy to feel like everything went out to sea with him. (Or her.) He’s gone, and it’s like trying to see the sun at night. Consider the notion that the wild spark of crazy love is always inside of you; it’s part of your organic make-up. It’s in your DNA. But something about your beloved allowed you to access that love. All of those feelings were yours, and they still are. Of course, heartbreak and longing are very real. That person’s unique companionship was a gift, and then a great loss. But it’s helpful to realize that he didn’t take it all with him. The feelings of joy and vitality came from you. They may fall silent when you are heartbroken, but you still own those feelings. At the very least, this perspective allows you to see that your vitality was not stolen. It will be there, dormant perhaps, and will shine again. This perspective was transformative for me; it allowed me to keep my balance, realizing that it’s not all about himand what he gives me. I own it and always will.